Wrexham player-manager Andy Morrell says memories of recent play-off games will shield his side from complacency as they chase a first Wembley date. The Dragons will take a healthy 3-1 advantage into Saturday's second leg of their FA Trophy semi-final away to part-timers Gainsborough Trinity. "We've been in two play-offs where we've been two and three goals behind and given it a real go," he said. "Teams have then been on the back foot against us. We know how hard it'll be." 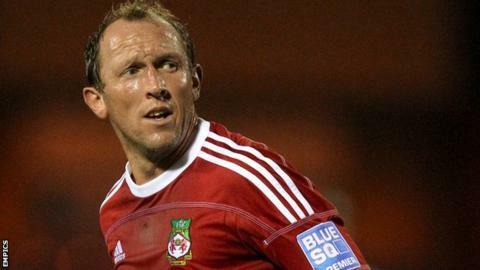 Morrell, who had a hand in Wrexham's third goal in added time of the first leg against Conference North side Gainsborough, was referring to two successive Blue Square Bet Premier play-offs against Luton. Last season, they recovered from a three-goal deficit to come within a goal of forcing the tie into extra time as Luton desperately held on for victory over two legs. Twelve months earlier, they briefly threatened a similar comeback after finding themselves in the same predicament. The encouraging conclusion for Morrell, though, is that a two-goal first-leg lead is difficult to overturn. "The first goal is going to be fairly crucial but if we start off right and start bright then hopefully we can nick it. But it's going to be a tough game, I know that," he added. "I'm hopeful more than confident. We're doing OK and on a decent enough run, going in on the front foot but we know these ties are tricky." Cardiff City, Swansea City and Newport County have all made Wembley appearances over recent seasons, leaving Wrexham as the only leading Welsh club not to have played in a showpiece final at the home of English football. Promotion to the Football League remains the firm priority for Conference leaders Wrexham, says Morrell, but a day out in Wembley would certainly be well received at a club that came close to financial meltdown. "It would be a great pick-me-up for the club and the town, and it would get a few people talking," said the 36-year-old striker. "We're not there yet. We've got half a foot there being in front but I know they are going to come out and give it everything because it's not often you get a chance to play at Wembley. "I'm sure they'll give every ounce of energy they have to try to peg us back. So we've got to go with the right attitude, the right focus to try to get something out of the game."